Notts County boss Jamie Fullarton became the latest Football League managerial casualty on Saturday, just 10 weeks after being appointed. BBC Sport looks at five things you may have missed, on a day Bolton headed ever closer to League One and a couple of debutants had instant impacts at their new clubs. Bolton fans might be happy just to have a club to support at all after their off-field issues this season. It has been another dramatic week at the Macron Stadium, with manager Neil Lennon leaving by mutual consent on Monday and the club's new owners paying off their outstanding tax bill to HM Revenue & Customs. Former Sunderland and Leeds boss Peter Reid has been brought in as a football adviser to assist caretaker Jimmy Phillips, but their first game in charge could not have gone much worse. Fellow strugglers Bristol City hit six unanswered goals to leave the Trotters marooned at the bottom of the Championship, 12 points adrift of safety. Wanderers will almost certainly be playing in the third tier next season for the first time since 1993. Millwall and Chesterfield's players could be forgiven for wondering who had scored for them on Saturday. Midfielder Chris Taylor rejoined the Lions on loan from Blackburn on Thursday. He scored what proved to be the winner for the League One promotion chasers against Sheffield United just two minutes into his first appearance since returning to the club. Meanwhile, winger Jamal Campbell-Ryce made Taylor's intervention look positively slovenly. Campbell-Ryce joined the Spireites on loan from the Blades on Saturday morning and scored his side's equaliser at Scunthorpe, seconds after coming on in the 59th minute. The Jamaica international had a loan spell with Chesterfield in 2004. He failed to score in 14 league appearances. Spare a thought for Colchester United. Last weekend, League One's bottom side led promotion hopefuls Wigan 3-2 going into the final minute, only for Will Grigg to pop up and score a leveller. This week Kevin Keen took his strugglers to third-placed Walsall knowing that they needed a win to keep their fading survival chances alive. It looked improbably like that was going to be what they were going to get after Alex Gilbey gave them the lead in first-half injury time. However, when it is not your season, it is not your season. Saddlers top scorer Tom Bradshaw popped up with an 89th-minute equaliser and four minutes into stoppage time Matt Preston struck to seal a remarkable comeback for the hosts. The U's are bottom of League One with 28 points from 37 games and are 10 points adrift of safety. Opens the scoring for his team against Crewe in the 34th minute. Booked in the 35th minute for his celebrations. Sent off in the 39th minute after being given a second yellow card for a poor tackle. The former Morecambe man missed all of the late drama, as first Marcus Haber levelled for Crewe before Tom Aldred restored Blackpool's lead in the 84th minute. There was still time for the hosts to be awarded a last-minute penalty, which Brad Inman sent over the bar to leave the Seasiders celebrating a huge victory in their battle against relegation and Redshaw breathing an equally large sigh of relief. 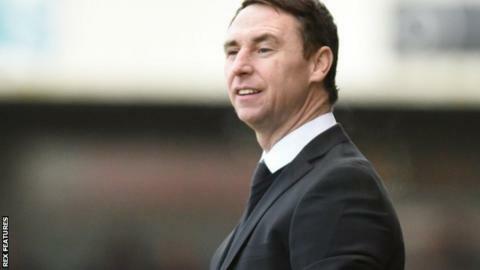 Here is what Notts County owner Ray Trew said about Jamie Fullarton upon appointing him Magpies boss on 10 January: "I don't think I have ever been as impressed by someone at an interview as I was by Jamie. "He had us all captivated throughout what turned out to be a lengthy assessment of his suitability for the role." It turned out Fullarton could not get his players to buy into his philosophies and after Saturday's 4-1 home defeat by Exeter City, his eighth loss in 12 games, he was sacked. The next man in the Meadow Lane hotseat will be the 10th manager to take control since 2010.